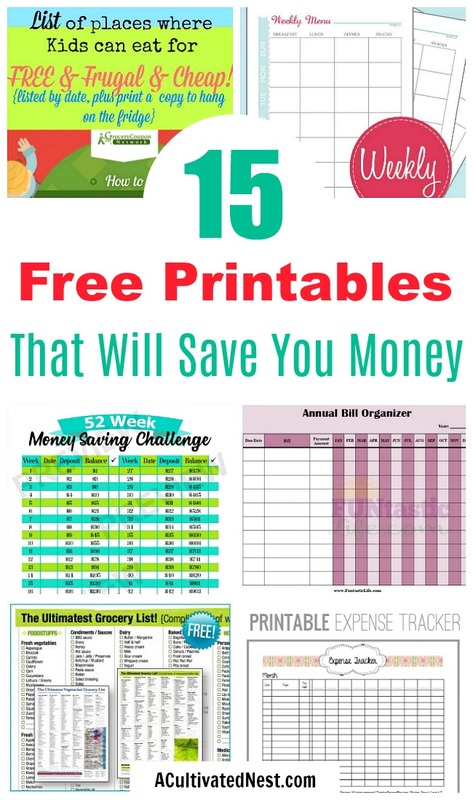 15 Free Printables for Saving Money. Did you know that simply being organized can be your ticket to saving money in the long run? 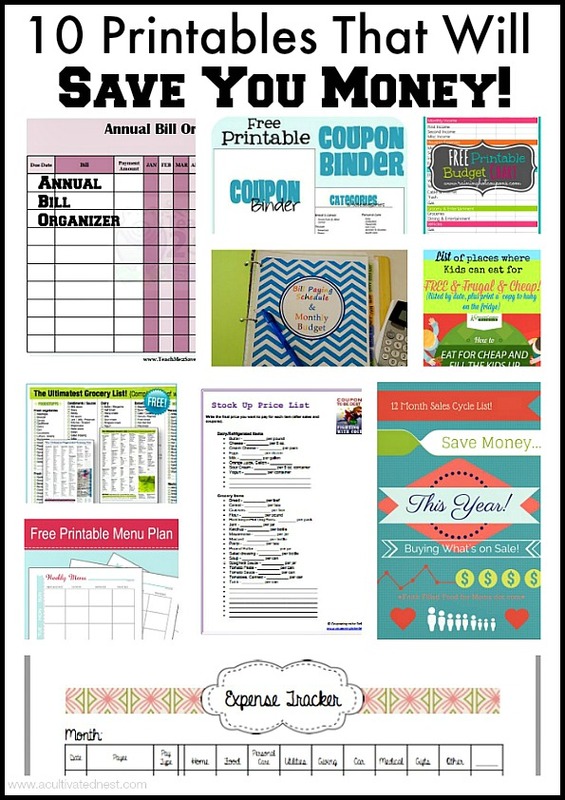 One of the best ways to stay organized when it comes to saving money is to utilize the free printables that can be found online. 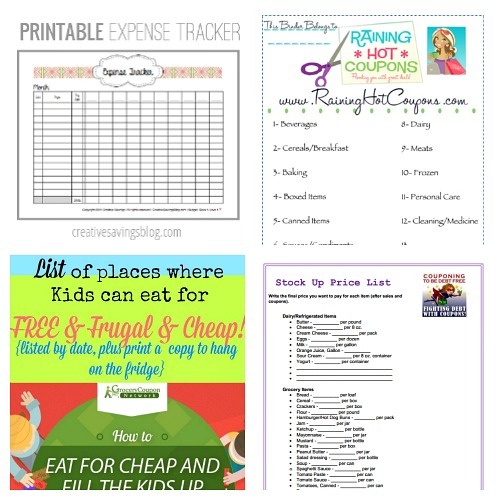 There are budget printables, menu planners, coupon helpers and more out there if you look. To save you time, I’ve combined my current favorite 10 Free Printables to Save You Money! And I’ve now updated it with 5 more handy free frugal printables! Being organized with paying your bills, knowing what you need and don’t need at the grocery store, planning your meals and being able to find and use your coupons, among other things, will save you a lot of money! Really! Rather than search them out yourself, I found 10 great free printables that will help you with this goal and put them all together below. 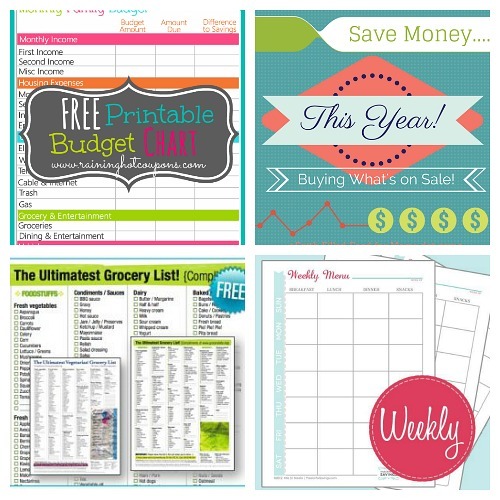 Consider this your “one stop shop” for free printables to help you save lots of money! If none of the printables below seem like what you need, you should check out our printables shop! 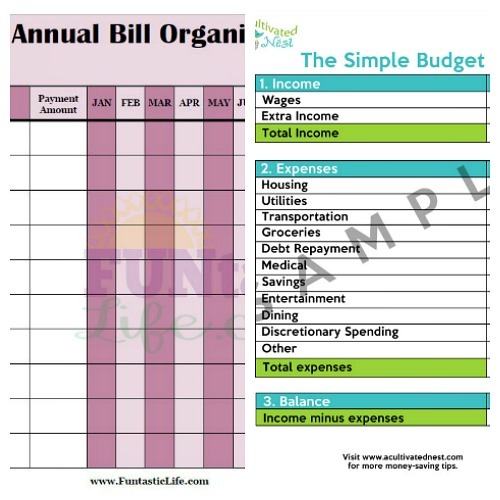 Using what I know about frugal living, plus the experience of years of working with other people’s free printables, I’ve designed several printable binders that are super helpful at organizing a frugal life! 1. Printable Monthly Budget Chart from Raining Hot Coupons. Every family needs a budget! This one is simple enough for beginners, but also good for more experienced budget makers. 2. Printable Planner for Sales Cycles from Faith Filled Foods for Moms. An easy way to save money is to shop with the sales. This printable ensures you never miss a sale cycle! 3. The “Ultimate Grocery List” from The Frugal Free Gal. If you fail to plan, you plan to fail. Use this free printable to plan out your grocery shopping trips and save money! 4. Weekly Meal Planner from Passion for Savings. It’s really easy to save money on food if you meal plan! 5. Expense Tracker from Creative Savings Blog. If you want to keep your family’s finances organized, you need an expense tracker! 6. Coupon Binder Pages from Raining Hot Coupons. Even though I now use digital coupons and rebate apps like Ibotta, I still clip coupons and bring my coupon binder with me to the store. It’s just such a great way to save money! 7. Printable List of Places Kids Eat Free from A Mitten Full of Savings. Why pay for your kids’ food if you don’t have to? This printable is a must for frugal parents! 8. Stock Up Price List from Couponing To Be Debt Free. If you want to save money by filling your pantry, this free printable is very helpful! You might also want to consider making a full grocery price book. 9. Annual Bill Organizer from Teach Me 2 Save. Being able to see your bills for the year at a glance is so helpful! 10. The Simple Budget from A Cultivated Nest. Think the printable budget template in #1 is too complex? My simple budget printable is super simple, super easy to use, but also super effective! Since I’ve made several more money saving free printables since this post was first published, I wanted to update it with 5 more helpful printables from my blog. 11. 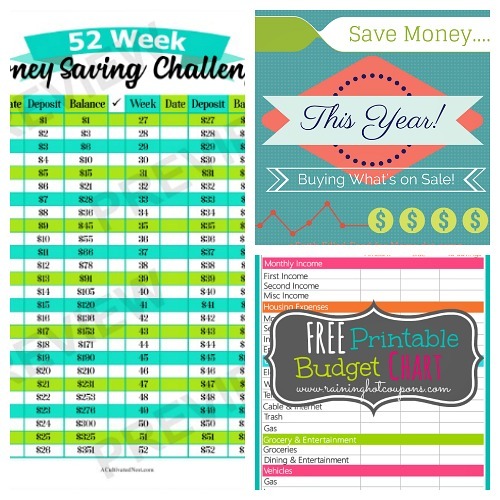 52 Week Money Saving Challenge Free Printable. Tend to struggle with saving money? Then you need to try this challenge! Something about working to achieve a challenge helps motivate even the worst savers! 12. 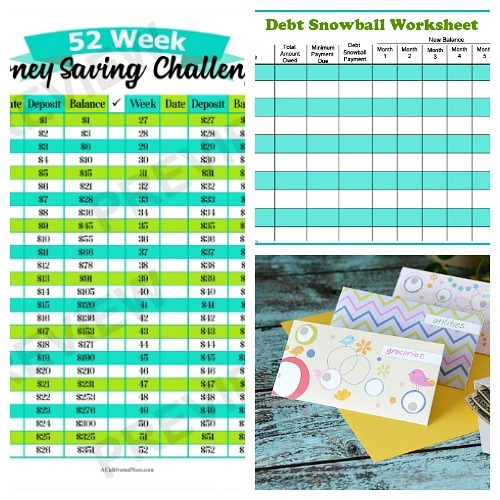 Debt Snowball Worksheet Free Printable. Dave Ramsey’s debt snowball technique is a very popular debt payoff system. Do it right, and you’ll pay off your debt fast (saving you money in the long run)! 13. Envelope Budgeting System Free Printable Envelopes. The envelope budgeting system is a great way to control your spending. And with these printable envelopes, you can be frugal in style! 14. 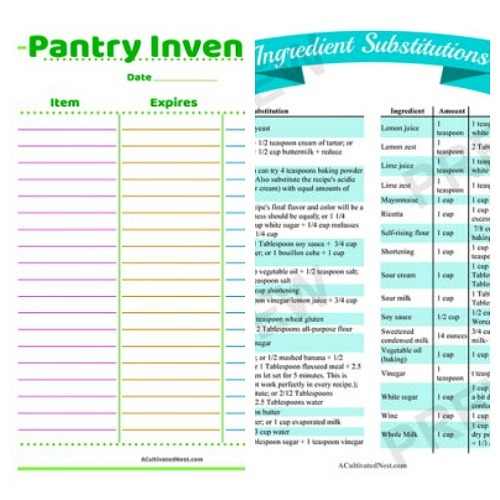 Ingredient Substitutions Chart Free Printable. A simple way to save money in the kitchen is to simply buy less ingredients! Instead, learn how to substitute ingredients you already have. Your recipes will turn out the same, but cost you less! 15. Fridge, Freezer, + Pantry Inventory Sheets. If you’re constantly re-buying things you already have you’re wasting money. Taking a food inventory of your fridge, freezer, and pantry helps to prevent this! How does being organized save you money? Hi Manuela! Thank you so much for featuring my Sales Cycle printable, I am honored 🙂 Have a blessed weekend! Love your site! Thank you my friend! I need all the help I can get to be organized:) Have a blessed Sunday! HUGS! Thanks so much for sharing! Will definitely be checking out all the other printables!! Thank you for sharing! Really useful and practical. I will share these with friends and family.